Congestion delays deprive commuters of leisure, rest and family time. Congestion also costs the Central Zone's businesses billions of dollars every year as critical shipments and workers are delayed.9 But not all areas within the Zone experience the same levels of traffic flow and delay. Some areas are relatively easily reached or travelled from, suggesting ability to handle new development. Travel to or from other areas can involve delays. Figure 4.1 shows the areas from which drivers experience relatively low levels of delay. In other words, for a morning peak hour auto trip originating in a highlighted area, below-average delays can be expected. The average delay across the area studied was 0.23 minutes per kilometre. The areas highlighted demonstrated an average delay of 0.14 minutes per kilometre or less. In general, road congestion appears to be much less severe outisde the GTA, e.g. in Hamilton, Niagara Region and smaller towns and cities. A large area subject to below-average congestion is found around Lester B. Pearson International Airport, including adjacent portions of Mississauga, Brampton and Vaughan. This may reflect the fact that relatively fewer trips originate from this area in the morning peak period, because it is primarily an employment area, such that those trips that do originate here do not tend to experience delays. A similar rationale explains why the downtown core of the City of Toronto is highlighted. The outer zones and the fringe of the GTA tend - by virtue of being on the fringe - to have less through travel. 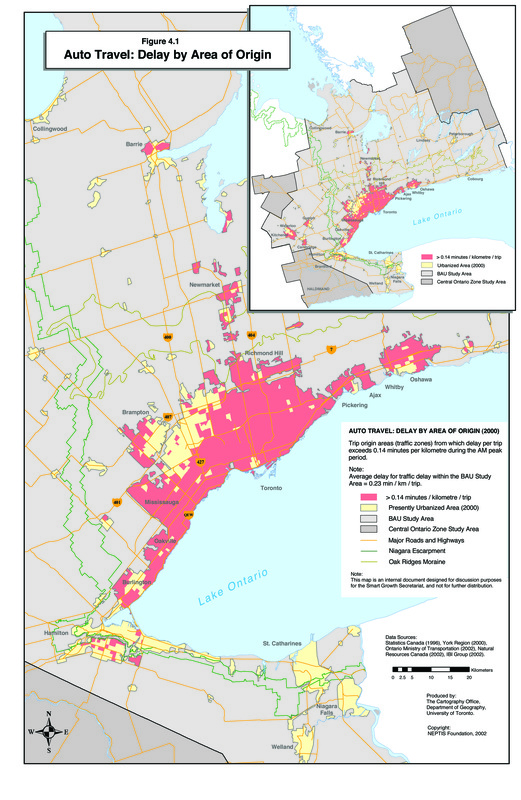 In order to exploit these existing road capacities, and accommodate growth with minimal new infrastructure requirements, the Smart Growth strategy could direct additional residential development to the areas highlighted on the map. Locating additional homes in areas from which significant delays exist can allow development to take place without overtaxing existing road networks. Travellers destined to Hamilton, Niagara Region and the fringe of the GTA experience relatively low delays during the morning peak period. Some of the smaller towns outside the GTA also have relatively low auto travel delays, such as Cambridge, Barrie or Peterborough. Again, fringe areas do not tend to experience the volumes that the rest of the GTA does, by virtue primarily of being on the fringe. As the fringe expands outward, however, increased delays can be expected in these areas. Other areas are both outside the high demand areas of the GTA, and have lower levels of economic activity, which can also translate into reduced travel demand. In order to exploit these existing road capacities, and accommodate growth with minimal new infrastructure requirements, the Smart Growth strategy could direct additional employment-related development to the areas highlighted on the map. Locating additional offices, stores or institutions in areas to which relatively low auto delays exist can allow development to take place without overtaxing existing road networks and minimising demand for new roads. Transit trips in the Zone, and the City of Toronto in particular (which accounts for the liion's share of all transit trips in the region), tend to be very uni-directional. This means that in the morning, the vast majority of trips on any route are in one direction, toward the location of jobs, while the counter-commuting direction on the same route might have significant capacities. This is particularly true with respect to travel by subway to the downtown core. Trains heading into the downtown in the morning peak period are overcrowded, while trains returning from the core northwards are often very sparsely used. This condition represents underutilisation of an important and expensive resource. New growth can be strategically directed to take advantage of these existing capacities. This means being able to accommodate new growth in a setting that offers a high level of transit service at low to no cost. In order to identify where these opportunities may exist, an analysis was undertaken to identify existing transit capacity in the Zone. Based on the assumption that excess transit capacity in the peak direction does not exist at present, only capacity in the counter-commuting direction was considered. The results of this analysis are presented on Figure 4.3. The areas (traffic zones) highlighted in green show areas of trip origin in which there is capacity of a minimum of 300 trips in the counter-commuting direction. Adding residential development to these locations can contribute to transit ridership that takes advantage of these capacities. These areas are found across the City of Toronto but extending across its boundaries into Mississauga, parts of York Region, and Pickering. Areas not highlighted on this map either do not provide extensive transit services (and thus have no capacity) or have transit without significant additional capacity. Figure 4.4 shows areas with existing transit capacity in the counter-commuting direction, in this case by the area of trip destination. In other words, for transit travel in the counter-commuting direction to these areas, there is existing capacity of at least 300 trips per traffic zone. While more fragmented than the origins map, the pattern is similar. 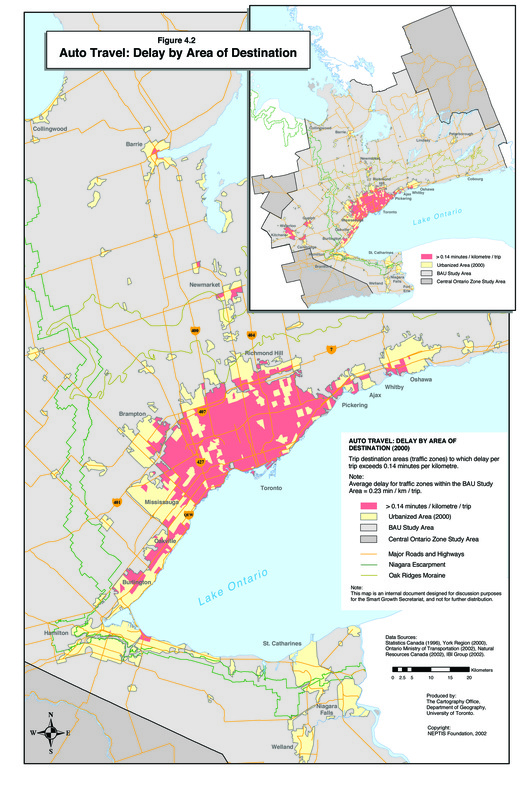 Most highlighted areas are located in the City of Toronto, extending into Mississauga. Outside the GTA, capacity can also be found in Kitchener-Waterloo and Guelph. Destination areas with significant transit capacity in the counter-commuting direction are appropriate locations for additional employment development. Although Hamilton and Niagara Region appear to have significant road capacity (Figures 4.1 and 4.2), they do not display transit capacity - either by area of origin or destination. Directing new growth to these areas will therefore not likely result in increased transit ridership in the absence of expanded transit service. Where the areas highlighted in green on the transit capacity maps coincide with the areas shown on Figure 4.1 subject to longer road delays (i.e. the yellow areas on Figure 4.1), it suggests that there is capacity in the transit system currently to accommodate a switch to transit by drivers travelling in the counter-commuting direction. Downtown and western Toronto show a large number of vacant school seats, while schools with spare capacity appear to be scarce in the rest of the GTA. Small towns and cities across the Zone also exhibit some spare capacity, including Hamilton, St. Catherines, Niagara Falls and Kitchener-Waterloo. In newer communities dots outlined in red likely represent newly constructed schools about to open.12 In more mature areas, schools outlined in red can in fact be mothballed, i.e. decommissioned, schools. In new communities, the construction of a large number of new homes triggers the need to transport children over long distances at first and is ultimately followed by the construction of new local schools. Figure 4.6 presents a composite of school vacancies, transit capacity by trip origin and areas with low auto travel delay by area of trip origin. It suggests existing school and transportation infrastructure capacities coexist in a few key areas in the Zone. Downtown Toronto, extending north and west, shows significant concentrations of these infrastructure capacities, as does the older part of Hamilton. 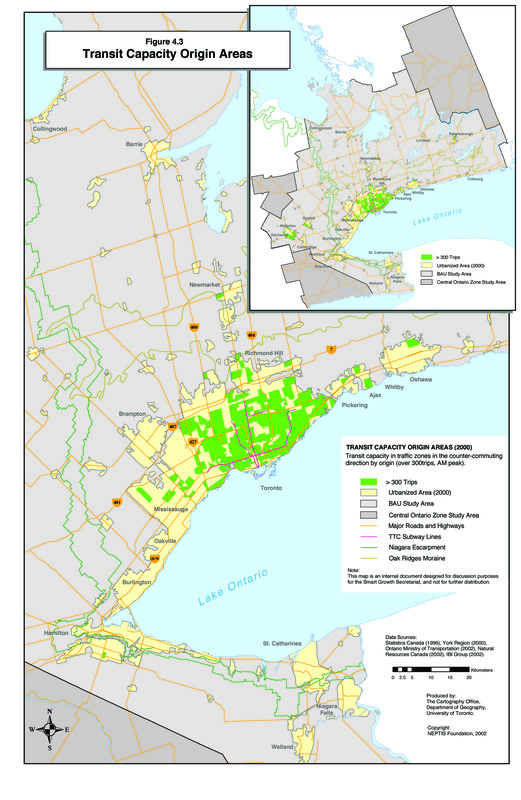 Other, primarily transit or road capacities, exist throughout a significant part of the GTA. 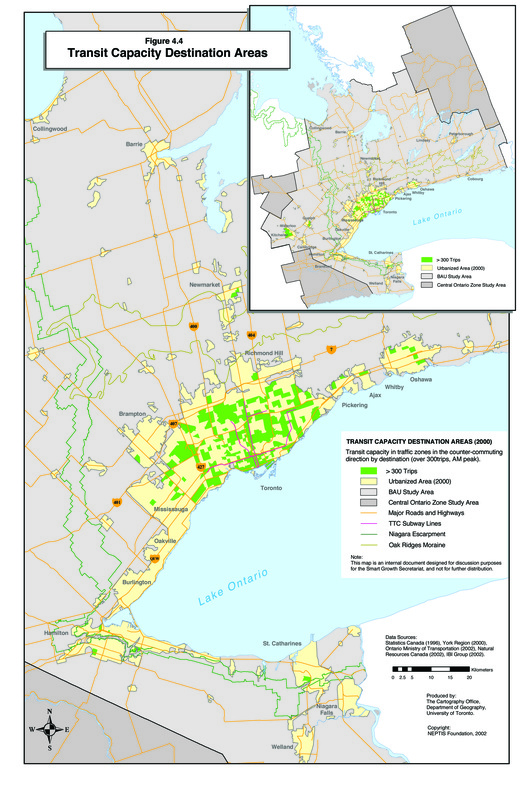 Other clusters of capacities exist in some of the towns around the GTA, including St. Catherines, Niagara Falls, Welland, Peterborough, and Kitchener-Waterloo. The map suggests areas to which new growth could be directed while incurring reduced infrastructure costs, compared to accommodating new growth on greenfields lands. In the locations shown on Figure 4.6, existing school and transportation infrastructure can support additional growth. Figure 4.6 shows areas of transportation capacity by area of trip origin - suggesting potential for residential development.14 A similar composite showing areas with transportation capacity by trip destination would suggest areas appropriate for non-residential development. In areas with significant spare capacity, new growth is able to take advantage of existing capacities in transportation and school systems and lead to reduced marginal infrastructure costs and increased travel by transit. In new communities, every new home, office, factory or store requires the construction of new infrastructure - schools, roads, transit facilities and equipment, water and wastewater systems, fire stations, community centres, etc. In fact, this situation is partially reflected in the differentials in development charges levied by each jurisdiction. In new communities, development charges are often many times higher than in mature municipalities, in an attempt to pay for the higher costs of providing new infrastructure. 8. An attempt was also made to also identify locations where existing capacities in the water and wastewater system resided. However, obtaining information at an appropriate level of geographic detail across the Zone was not possible within the scope of this project. 10. The average of average delay across the area studied is the same 0.23 minutes per kilometre as for the origin areas analysis. The areas highlighted demonstrated an average delay of 0.14 minutes per kilometre or less. 11. A mothballed school is a school that has been closed by the school board but retained for potential future use. 12. Schools represented by dots outlined in red are those schools where the total capacity is the same as the number of vacant seats. This can imply either a mothballed school or a recently completed but not yet operating school. The data source does not allow us to differentiate the two types, but typically the former will be found in the older urban areas and the latter in newer suburban areas. 13. Total of (capacity-enrolment) for all schools. Overflow in schools over capacity was deducted from total (e.g. portables). Source: Ministry of Education, personal communication (capacities) and York Region 2002-2005 Capital Project List. 14. Because morning peak travel was analysed, the origins tend to be residential areas, and the destinations employment-oriented. In order to take advantage of the existing capacity, the right kind of development must be encouraged in the right place - residential in the places of origin with capacity, and employment-oriented development in the places of destination with capacity. There are some areas that have capacities as both origins and destinations - in these areas either residential or employment-oriented development would be able to capitalise on existing capacities.